BEVERLY HILLS, CA - Anchor Bay Entertainment and RADiUS are proud to announce the home entertainment release of the critically acclaimed Keep on Keepin' On . Selected for the Academy Awards shortlist for Best Documentary Feature, the film will be available on DVD beginning January 13, 2015. 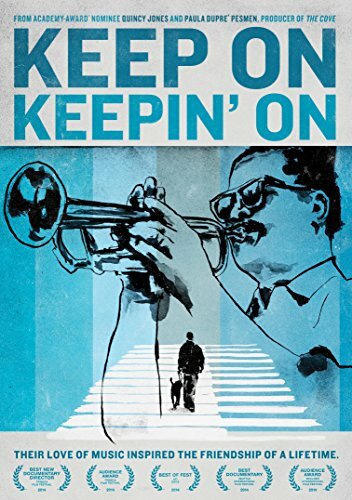 Shot over the course of five years by first time filmmaker Al Hicks, Keep on Keepin' On depicts the remarkable story of 93-year-old jazz legend Clark Terry. A living monument to the Golden Era of Jazz, Terry - a mentor to Miles Davis - is among the few performers ever to have played in both Count Basie's and Duke Ellington's bands. In the 1960's, he broke the color barrier as the first African-American staff musician at NBC - on "The Tonight Show". Today, after a life spent working with and teaching the most totemic figures in jazz history, Terry continues to attract and cultivate budding talents. Keep on Keepin' On highlights his friendship with the preternaturally gifted Justin Kauflin, a blind, 23-year-old piano prodigy who suffers from debilitating stage fright. Not long after Kauflin is invited to compete in an elite Jazz competition, Terry's health takes a turn for the worse. As the clock ticks, we see two friends confront the toughest challenges of their lives. Kauflin's work on the film's score with composer Dave Grusin sets the tone for a story that spans decades, lifetimes and the entire history of modern Jazz, complete with firsthand anecdotes from Jones and Herbie Hancock. Keep on Keepin' On is a film crafted with great affection by Hicks -another former student of Terry's - a grace note for his teacher, infused with soulfulness and serendipity. Paula DuPre' Pesmen (behind the Academy Award winning THE COVE and the Oscar nominated CHASING ICE) produced the film with seven time Academy Award nominee Quincy Jones who also counts Terry as his mentor. Jones came on board as producer after walking into the film as one of its subjects, discovering Justin's talent purely by chance during a visit at Clark's home. After taking home the prize for Best New Documentary Director and Audience Award at the 2014 Tribeca Film Festival and the Best of the Fest at AFI Docs, RADiUS released the film theatrically on September 19, 2014. Keep on Keepin' On has a running time of 89 minutes and is rated R for some language. DVD special features include Deleted & Extended Scenes, Jazz Archive, Q&A with Director Al Hicks and Alex Baldwin, Additional Interviews, Clark Terry on Performing and Clark on Teaching. RADiUS is the boutique label of the Weinstein Company (TWC) and the first studio division dedicated to both multi-platform VOD and theatrical distribution. Utilizing both traditional and digital media, RADiUS-TWC brings the highest quality films and other specialty entertainment to a wider audience than ever before. Founded and led by Tom Quinn and Jason Janego, the label continues to develop innovative distribution strategies to make marquee content available to consumers where, when and how they want it. The label's inaugural slate included such films as BACHELORETTE (the first multi-platform film to hit #1 on iTunes and the only multi-platform release to ever reach #4 for top Cable VOD performers) and Cannes competition entry ONLY GOD FORGIVES directed by Nicolas Winding Refn and starring Ryan Gosling and Kristen Scott Thomas. Recent releases include: Morgan Neville's Oscar winner 20 FEET FROM STARDOM; Rob Epstein and Jeffrey Friedman's LOVELACE; Zachary Heinzerling's Oscar nominated CUTIE AND THE BOXER (Sundance 2013 U.S. Documentary Directing Award), Jacob Kornbluth's INEQUALITY FOR ALL (Sundance 2013 U.S. Documentary Special Jury Award) and Keanu Reeves' directorial debut - MAN OF TAI CHI in which he also stars. In 2014, RADiUS' slate features (among others): Bong Joon Ho's runaway hit SNOWPIERCER, BLUE RUIN (winner of the FIPRESCI International Critics Prize at the Cannes Film Festival), Errol Morris' THE UNKNOWN KNOWN, FED UP from Laurie David and Katie Couric, THE ONE I LOVE starring Elisabeth Moss and Mark Duplass (Sundance), Alexandre Aja's HORNS starring Daniel Radcliffe (Toronto), Berlin titles: WHEN ANIMALS DREAM, and ESCOBAR: PARADISE LOST (Benicio Del Toro) as well as two time Tribeca Film Festival winner KEEP ON KEEPIN' ON and BEYOND THE BRICK: A LEGO BRICKUMENTARY. The company is embarking on a CREEP trilogy alongside the Duplass brothers and Blumhouse Productions after the film's highly praised SXSW premiere and also acquired SXSW Grand Jury prize winner THE GREAT INVISIBLE. RADiUS just picked up the Anna Kendrick starrer THE LAST 5 YEARS, Chris Evans' directorial debut BEFORE WE GO and the Nick Kroll, Rose Byrne and Bobby Cannavale starrer ADULT BEGINNERS all out of Toronto. Most recently, it bought the Safdie brothers HEAVEN KNOWS WHAT which world premiered at the New York Film Festival.